Colombo is suited to become South Asia’s commercial hub, according to Liang Thow Ming, Chief Marketing Officer of the US$ 1.4 billion Colombo Port City project being executed by China Harbour Engineering Company (CHEC). He told reported that the city is South Asia’s cleanest and most liveable city, while also being the commercial capital of a country that has no conflicts with other nations in South Asia. Ming noted that from a general acceptability point of view, Colombo could be the Singapore of South Asia. 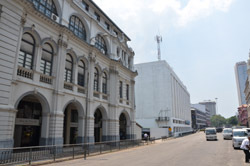 Ming further stated that Colombo Port City (now renamed Colombo International Financial City) will be an international commercial and financial hub with its own British-based legal system and labour laws attuned to the needs of modern businesses that will see investments from across the world.